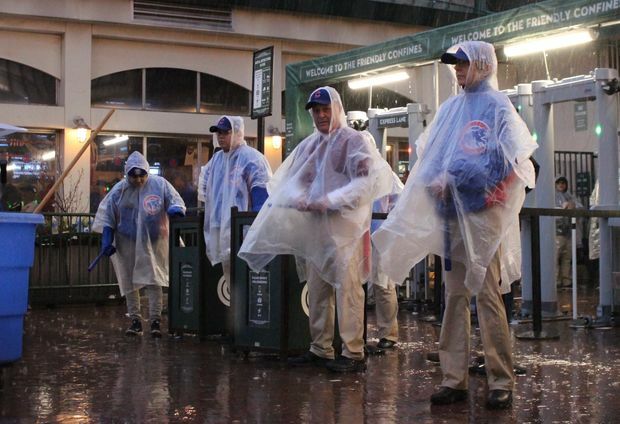 Cubs employees covered themselves with ponchos as a sudden downpour delayed the Cubs home opener. The Cubs are once again facing rain during Tuesday's Game 4 at home. CHICAGO — The Cubs and Nationals could be facing a rainstorm during Tuesday's Game 4 at Wrigley Field. Rain showers are expected to hit the city as early as noon and continue through the evening, said Andrew Krein, a National Weather Service meteorologist. The game is scheduled to start at 4:38 p.m.
"There should be rain at 4 o'clock," Krein said. The rain will likely be "more moderate" and could come in fits and bursts, Krein said. Luckily, thunder and lightning aren't expected as far north as Wrigley Field, though those further south might have to watch out for them. The storms will be accompanied by 15-20 mph winds going out of the northeast, making it a "pretty breezy" day, Krein said. Temperatures are expected to be around 60 degrees at Wrigley when the game starts, Krein said.